Myth and mystery have surrounded the origins of the haggis. Just where did this unusual dish come from, what is it made of and what does the name mean. 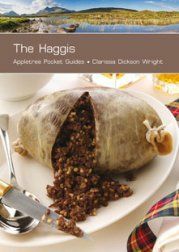 The Haggis is written by well-known and respected food writer Clarissa Dickson Wright reveals the fascinating truth behind Scotlands national dish. Many interesting facts come to light such as the fact that haggis isnt unique to Scotland and is produced in a variety of forms worldwide.But yet it will be forever closely associated with Scotland, thanks to Robert Burns and his immortal Address to the Haggis (which is also included here). There is also guidance on holding your own Burns night. Illustrations and photographs throughout. .